April 4, 2011 Dan O. If I had about 8 minutes to relive again and again, I think I’d choose….well….that’s a story for another day folks. This is the sophomore effort by Duncan Jones, who some may know him as the director of the 2009 sleeper hit Moon, and others may know him as David Bowie’s son. But look out Bowie, your son is starting to pick up some steam now. Probably the best thing about this film is the premise that is sort of a combination of Groundhog Day, Memento, and a slash of Inception that seems to work out so well. Duncan Jones is able to grab you into the film and direct it in a way that feels original enough that I didn’t think about its similarities to other films until it was over. The editing is also very solid, and you can’t stop but wonder what exactly is going to happen next, and the suspense works out very well. The movie never feels repetitive even though the same events happen over and over again because they’re each constructed differently enough to feel fresh. My main problem with this film is that the script is kind of lackluster. 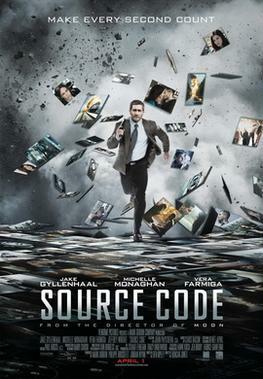 Source Code is written by Ben Ripley, who previously wrote two straight-to-DVD Species sequels and one made-for-TV movie. The script has plenty of problems, mainly it being just a combination of ideas from other films without too much originality to it. There’s also a nice little amount of human depth to this story which I actually did like, but the ending here doesn’t do much to support that nice attribute. While Jones does an excellent job giving the film humanity and life for most of the movie, the conclusion just feels forced and unauthentic. I don’t want to give away too much, but it feels like it should have ended on a much darker note than it does because either the writer or the studio didn’t want to scare away too many moviegoers. While I don’t mind happy endings when they happen in films like these, it’s just odd that this film seemed like it was going to go in another direction, but instead ended on a bad note. The saving element to this film that really elevated was the performances from the cast, mainly Jake Gyllenhaal, who I think really needed this movie. Jake plays Colter Stevens, and right from the get-go you have no idea who this guy is, and how he’s going to act, but after awhile you really start to see the situation he’s in, and you can actually believe the steps he makes. His charm works here, and by the end you really do find yourself cheering him on, hoping that in the end it all works out. I think this film will really remind people as to why he is such a good leading man. Michelle Monaghan is cute and likable as Christina, and provides a good romantic interest for Gyllenhaal’s character. Vera Farmiga plays Goodwin, who is basically a head in a box, but she somehow elevates her character into a more developed persona and seems more human than I would have expected. The painfully underrated Jeffrey Wright is good here as Dr. Rutledge and makes the best of his villainous-like character. Consensus: The ending and writing may be a bit of a bummer, but Source Code is uplifted by Duncan Jones’s fearless direction, and good performances from the cast, especially Jake Gyllenhaal, will keep viewers on the edge of their seat throughout the whole ride. Sweet, I aim to see this on the weekend. I totally agree with you on the script! Some of the lines especially that are given to Monaghan don’t really work, and without the actors I don’t think the characters would’ve had as much depth. It does work out fine in the end, but I do think the idea Ripley has is 9/10 whilst the writing drops down to a 6. I’m really looking forward to seeing more from Jones! I liked this a lot more than I expected, but Jones really is a force to be reckoned with and I can’t wait to see more from him. Thanks! I was supposed to see this yesterday. Unfortunately, plans got messed up and didn’t get to see it. Still want to see it though. I’ve heard good things about it. I always love a good thriller. On that note, won’t be reading this whole review right now, cause I don’t want to spoil anything. But definitely glad you seemed to like it. It’s good, and I do think you should try your best to totally see it without a doubt. Finally got around to seeing this. I did enjoy it, but it definitely had some faults. As you mentioned, the script was weak in some departments. And I’m of the same mind that the premise was a great one and seemed fresh enough that you weren’t all “been there, done that” during the ride. Though, do to some lacking in the script, it didn’t fulfill its potential as much as it could have. On the repetitive thing, I agree that it never did seem repetitive though that’s exactly what the movie was about. In fact, I actually thought it wasn’t repetitive enough. During some of those scenes where we never leave the “capsule” but he flashes back to the source code over and over again, I feel we should’ve been taken on a couple more rides with him. Give us one or two more rides down that scenario and show us how some of it played out and what all was happening. As it was, it just felt like I didn’t get enough of that part. Glad you liked it man! Overall it was a good film, just not perfect like everyone was making it out to be. For this to end on a darker note wouldn’t have been very Jones. Moon, for its inherent moral and ethical atrocities, breathes optimism in the final shot as Sam Two happily rockets his way back to Earth as voiceover informs us of how his future actions cripple Lunar Industries. For Jones, hope springs eternal even in the face of the outrages exhibited upon his protagonists; that’s part of his personal vision as an artist and I think something we’ll likely see in each of his pictures from here on out. Jones seems more interested in exploring how people rise above the dispassionate and callous actions of their peers and superiors and find an affirmation of their own life in doing so, and I think mostly he’s interested in discussing the grey area of scientific progress. Source Code really isn’t all that different from Moon; both their heroes are led through circumstances with the wool pulled over their eyes until they forcibly yank it off themselves and receive the full picture of their situations. Ostensibly, their lab experiment livelihoods are meant for the best intentions by their superiors but can just be easily perceived as unfeeling, but I love the questions that that particular theme brings up itself. Is it wrong to contain a man in the way Colter is for the sake of saving countless lives? For me, this is the single best and most thoughtful movie of 2011. While there are shades of Groundhog Day, Memento, and maybe Inception, they’re only shades and none of them detract from the meaning Jones and Ripley derive from the script. I frankly think comparing this to a Bill Murray comedy so prominently kind of does a disservice to Source Code, and I don’t see that much of Inception in here beyond questions of alternate worlds, or of Memento for that matter beyond Colter’s crappy memory and how his memory loss is taken advantage of by others. We’re not talking about major, plot-driven inspiration here, just small details that help make up the whole of the picture’s identity. Getting back on track– loved it. Jones is 2 for 2 so far, and I cannot wait to see what he does next. Lot of info here Andrew, but good stuff. Thanks for the comment! Hey hey .. While I do agree with you that the script is probably the worst thing about SOURCE CODE, I do think the lack of meat spread to the majority of the performances. The entire cast on the train, save for Jake, seemed to be completely without direction to me the whole time, especially Monaghan. And the way Jones focused on all the tiny train details that might lead to solving the mystery was so blatantly obvious that I cannot comprehend how anyone sees this as a solid film for adults. Adults don’t need their hands held as much as Jones grabs them here. Well, they shouldn’t anyway. True, it was a little too obvious at points but I still had a good time, wondering just what this whole “Source Code” thing was all about. I am quite excited to see what Duncan Jones does for his third feature. I loved Source Code and it is one of my favorites so far this year. And thanks for checking out my site and leaving comments so often. Very much appreciated. No problem man! This is good, but his third is going to be awesome too. Thanks!